Maureen Paton thought she’d met Mr Right – but would their fledgling relationship hit a rough patch when she booked them on a cruise? When I told them our plan, the expression on my friends’ faces suggested I was out of my tiny mind. And I could hardly blame them. After all, holidays can put any relationship under strain if things don’t go quite to plan. Norman and I had only just met – well, it was four months since we’d first hooked up online – and here we were, running away to sea. Unlike my friends, I was brimming with confidence. For one thing, I knew my cruising. I was a veteran of sailing down the Nile, up the Norwegian fjords with a Hurtigruten cargo ship, round the Mediterranean on the Oriana and across the Gulf of Mexico from New Orleans. I loved cruising in all its forms and I was sure Norman would too – he just didn’t know it yet. And so what if our first holiday together was a little high-risk? If we could survive 12 days in each other’s company with nowhere to stomp off to when things went wrong, well, the sky was the limit. 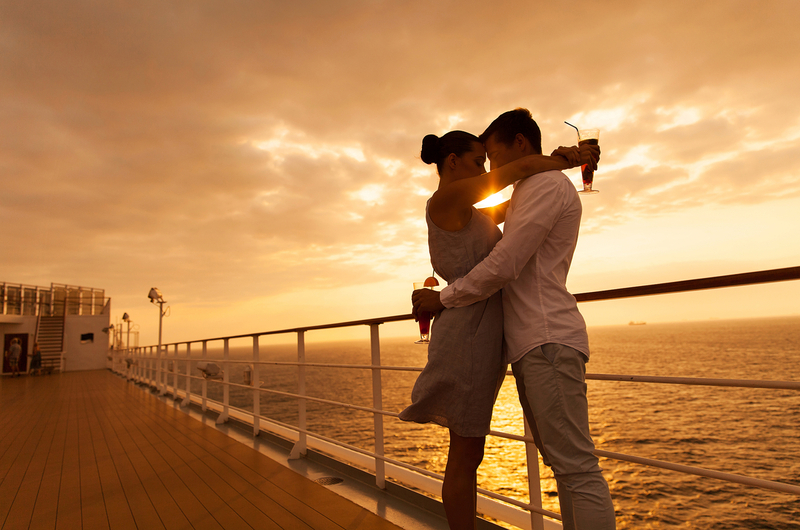 And a cruise ship is the perfect place for dressing to impress, so it couldn’t help but be a romantic experience. The more I thought about it, the more sensible my plan appeared. By doing all the navigating for you, cruising takes the hassle out of holidays. Every time you arrive somewhere new, you leave all your baggage – of the lugging variety – in your cabin and surrender yourself to whatever the new day brings. Somehow that works with emotional baggage too. It would just be Norman and me, and the world would be ours to discover. But where to go? Since Norman was a cruise virgin, I decided to break him in gently with a tour of the Med. Voyages of Discovery’s 12-day Colours of the Mediterranean seemed ideal, taking in Sardinia, Sicily, Malta, various Greek Islands and Athens, complete with hot-and-cold running guest lecturers and live theatre shows every night. And with just 270 cabins and 35 suites, the Voyager wouldn’t be overwhelming for a first-timer. VoD describe the experience as “small-ship cruising”, though with four bars, a library, a lido pool, a gift shop, internet hub, fitness centre, spa and beauty salon, there’s certainly no lack of amenities. Norman’s one fear – at least, the only one he owned up to – was finding a lot of old-school formality on board (as a rock-music author, that’s not really his bag). Yet the ship’s manageable size, and the open seating at her two restaurants – the table-service Discovery and the self-service Verandah – made dining pleasantly relaxed, with plenty of mingling. We met a former BBC produce who’d worked on Juke Box Jury, a retired celebrity photographer who traded Beatles and Stones anecdotes with Norman, a wine merchant, an Asian-American entrepreneur and a Japanese-American husband-and-wife team of retired NASA scientists. It’s difficult to imagine more varied or interesting company. And our itinerary ran like clockwork, just as I knew it would. Voyager crew met us off the Eurostar at Marseille, and with sommelier-like smoothness they decanted us into coaches for a quick city tour before embarkation. Our first port of call was Valletta in Malta, which has to be one of the world’s most picturesque harbours. We took a trip round it, on a little launch full of locals, rather than the over-priced tourist boat. Sicily was fabulous too – especially the medieval town of Erice, the eerie salt marshes and windmills of Marsala, and the Baroque cathedral at Syracuse, in whose shade we enjoyed an indulgent lunch. As for Crete, I hadn’t been back since my student days four decades ago when we slept on the flat roof offered by a Cretan farmer, whose only words of English were “Massey Ferguson”, and whose hospitality consisted of bread so hard it had to be dipped in water to make it munchable. This time round we docked at Chania to visit an art gallery in an old mosque, and a maritime museum focusing on tales of heroism from the Second World War. For lunch we enjoyed fried feta in honey, and mushrooms cooked in thyme. How did our relationship stand the test? Well, there was one dodgy moment over lunch that day in Chania. Norman had already established that our bill didn’t include a tip, only for silly old me to ask the waiter to confirm it. “That is really irritating,” said Norman, looking really irritated. But as we strolled along the jetty after the meal, he took my hand and talked about something else. I realised that, having made his point, he’d moved on. And that’s when I decided we had passed the compatible-couple test. We spent our final night in Athens. Because of a technical issue the ship had to be dry-docked overnight in Piraeus, but with exemplary smoothness we were conveyed to a hotel with a view of a floodlit Acropolis from its rooftop balcony. How romantic was that? Well, as it turned out, very. Reader, he’s moving in with me later this year. Try to book an outside cabin. This is not the time to feel claustrophobic – and a window will give your new relationship room to breathe. Sit down together before you leave and decide which excursions you fancy taking. Then there won’t be any onboard arguments. If you both need a new holiday wardrobe, why not go shopping together? It’s a great way of getting to know each other’s tastes. You can do the same with your holiday reading-matter, too.